Iggy Azalea is a literal goddess, halo and all, in her neon-lit 'Savior' video. The potential of a visual project is obviously big news to fans of the “Mo Bounce” femcee. 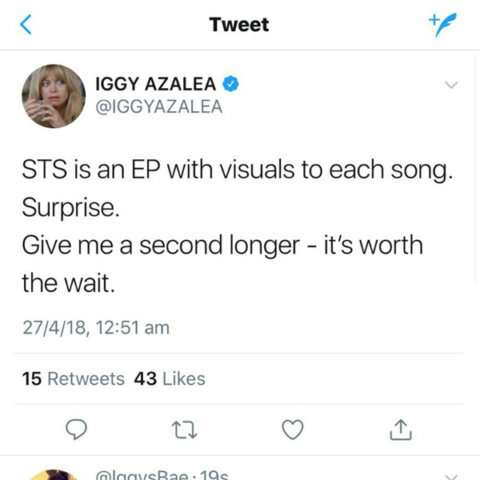 Considering her track record with visual projects such as the Clueless-inspired “Fancy,” it will be interesting to see what a project like this brings to the table. “So far we have heard Surviving The Summer’s trop-pop lead single “Savior.” The Quavo-assisted track received a video treatment from Colin Tilley that dripped in religious metaphors. Although it missed the charts across the globe, it seems like she has some seriously exciting projects in the works. The decision to roll out an EP instead of an LP is also an interesting move. Doing so will enable the Aussie to hone in on the biggest hits she has recorded in the years since releasing Reclassified in 2014. Check out the evidence below! Would you be here for this? Let us know below, or by hitting us up on Facebook and Twitter!